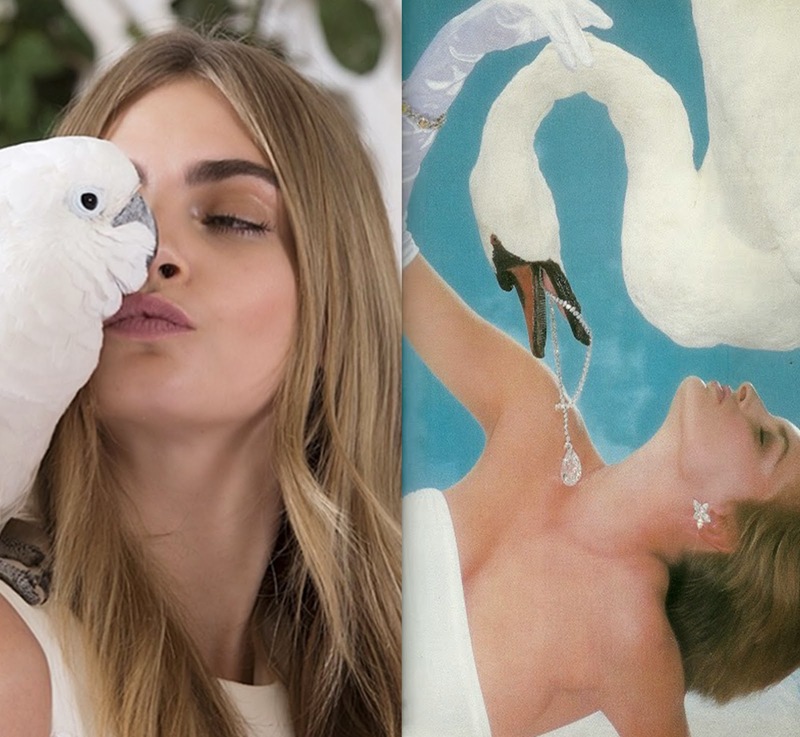 Was Cara Delevingne's Mulberry campaign inspired by this hilarious editorial from the 80s? Cara Delevingne's Spring 14 campaign for Mulberry has been getting a lot of buzz lately, and we're as into it as the next guy. Her animal tea party is the perfect blend of hipster and adorable. It's hipstorable, if you will. But as soon as I saw it, I realized what it reminded me of. This is a special one kids. So special that I've been keeping it in my back pocket (blog drafts) for 3 years (!!!) until I knew what to do with it. And finally it's day has come. Let us now compare and contrast the beautiful Mulberry campaign with this probably coke-binge-induced photo shoot from the August issue of Town & Country, 1985. So without further ado, here is my favourite thing from a magazine ever (and now one of my favourite things on the internet!) Please excuse the poor quality of the scans, they come from a magazine older than you. 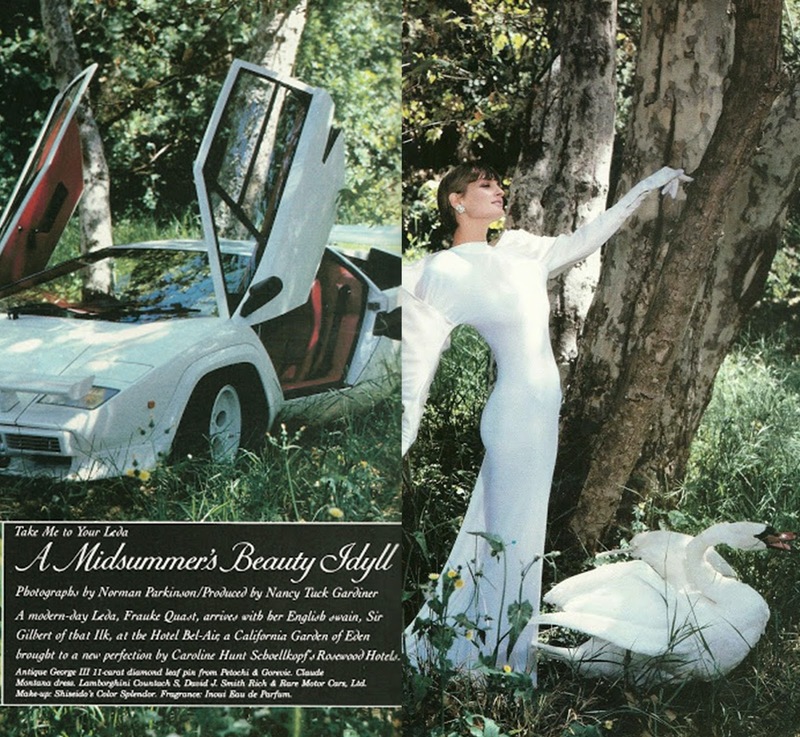 The 12 page vintage spread features 80s supermodel Frauke Quast, as herself (!!) Lets say for the sake of comparison that she was the Cara Delevingne of 1985. Ok maybe that's pushing it a little, but they both clearly have an affinity for white miniature ponies, white birds and erm, the finer things. 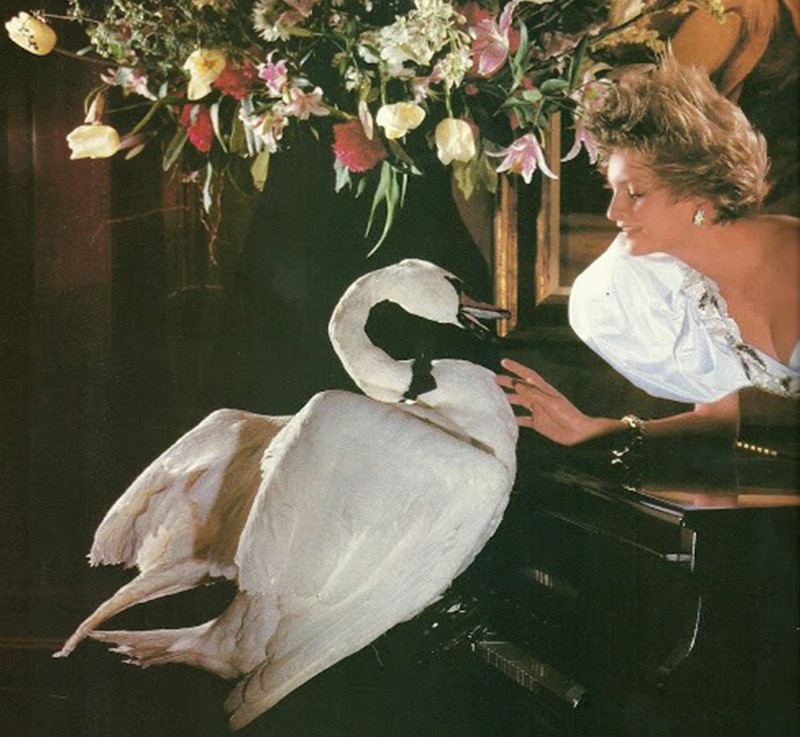 Oh and in case you're wondering, his name (the swan) is "Sir Gilbert of that Ilk". Obviously. Anyway, Frauke and Sir Gilbert arrive at the Hotel Bel-Air in their Delorean (as you do). It seems if you show up in a wedding gown with a swan they just let you park anywhere. The two love-birds (see what I did there?) take a romantic stroll in a pond. Frauke chooses an unfortunate gown. He then showers her with lavish gifts like this miniature riding pony. Luckily she's changed into a much more appropriate, blazer and pantyhose pony-riding ensemble. 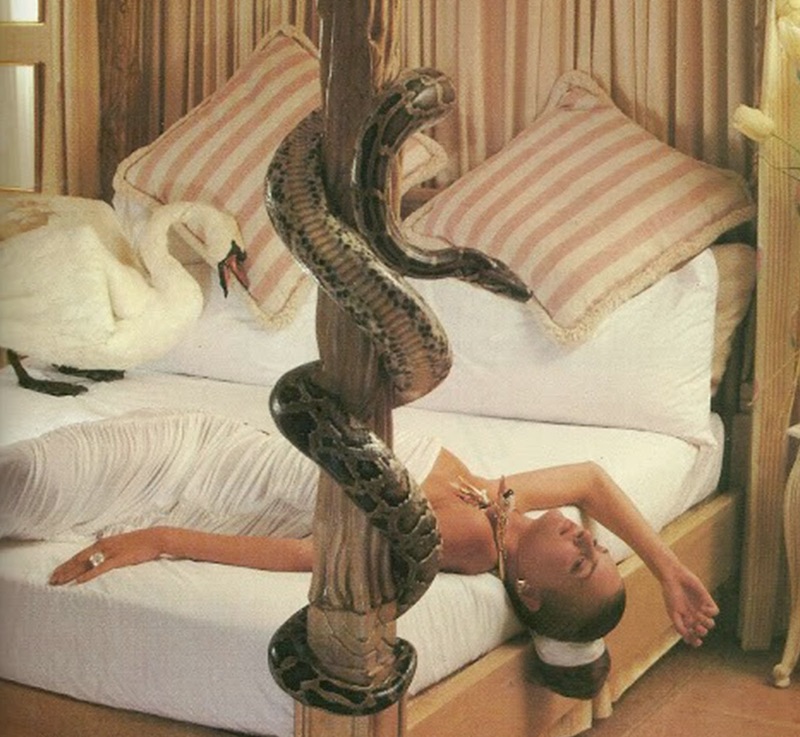 ...and having his way with her on a 4 poster bed while a snake watches. Pretty badass for Town & Country, no? Don't worry though kids, they follow-up their indiscretion with a wedding (pearl face-jewellery and detachable feather sleeves were totes all the rage, guys). Yay, dream wedding! ...followed by a gentle serenade. And the two live happily ever after. Don't you just love a good love story?? Gotta say, we love Cara, but prefer the creepy original version. Fräuke even matches her pumps to her pony bridle! 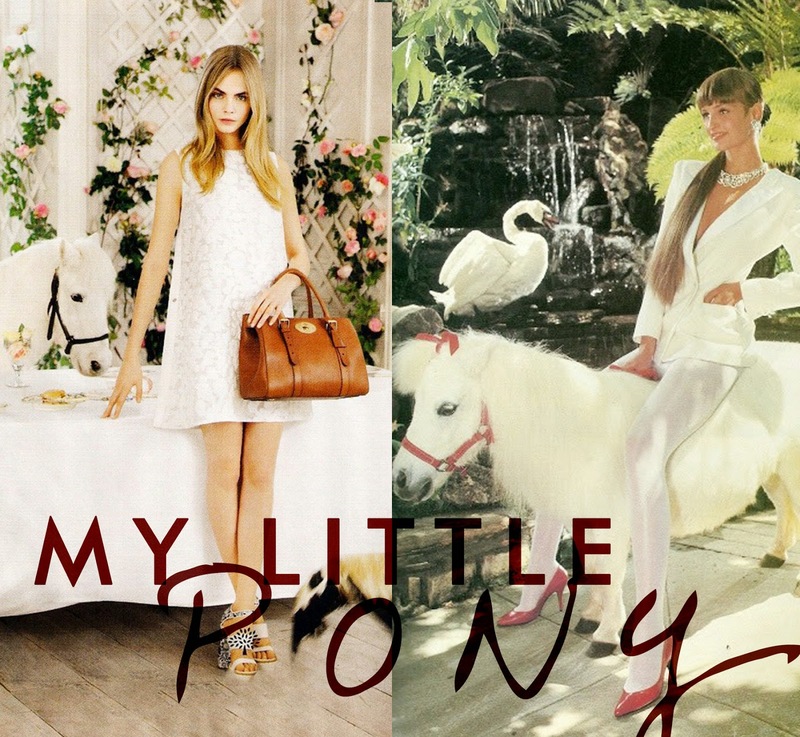 Forget the diamonds and bags, we just want to know where we can pick up our own miniature pony.